Эта меховая подушка также доступна с двусторонним меховым пошивам. Мы также с удовольствием изготовим данную подушку желаемых размеров на заказ. The Canadian raccoon (procyon lotor) is native to North America. The black-colored face mask around the eyes is characteristic of the Canadian raccoons. The hair of the raccoon has various gray and brown shades. Like many other predators, the Canadian raccoon has only a few natural enemies. To prevent overpopulation, professional hunters control the raccoon population. One of our most important objectives is to make sustainable use of existing resources and reconcile them with nature. We purchase our raccoon skins directly from the Fur Harvesters auction in Canada. Fur Harvesters is well-known for its high-quality fur skins, and therefore they are a perfect source for our premium fur products. If you decide to buy a Canadian raccoon product, you can be sure to receive a quality natural product from controlled hunting. 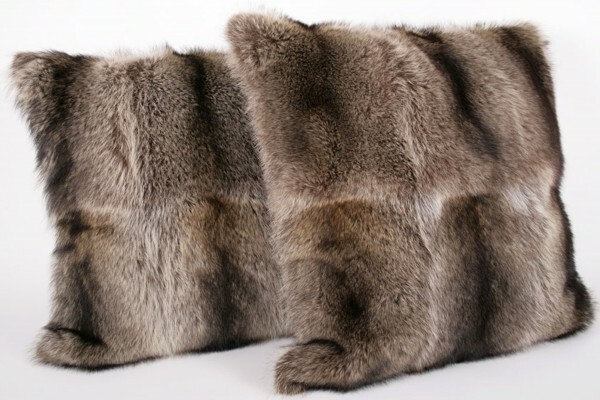 If you have any questions regarding our raccoon fur blankets, please do not hesitate to contact us. Ссылки на другие веб-сайты "Подушка из меха енота"
Оценки покупателей по "Подушка из меха енота"